The Biology Department serves more than a thousand undergraduate majors and minors, and provides courses for students of all majors. Explore the links below for more information. Find out how to arrange a meeting with a Biology Department advisor. A description of the courses required to complete the Biology major. Course guides with suggested plans for completing a Biology major. Ready to become a Biology major? Here's how. All students must complete an Integrative Experience requirement in their major, as part of the University's general education program. A description of the courses required to complete the Biology minor. Biology honors students may choose to complete departmental honors. Biology majors may choose to spend a semester or two in international or domestic exchange. Descriptions of all Biology courses. The Biology Department has established learning goals for its majors. We offer a range of opportunities for undergraduate participation in faculty research. Each year, the Biology Department honors a few undergraduates with small scholarship awards. The Biological Sciences Student Association welcomes all undergraduate students interested in the life sciences. 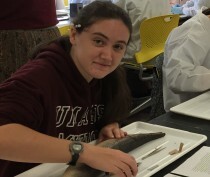 The Biology Department sponsors two residential programs for first-year students. The BCRC supports the computing needs of Biology students and faculty.